These neoprene rubber sheets are non-cellular (NOT sponge or foam), just pure solid black rubber. It's smooth on both sides. May have some minor superficial surface imperfections as with most elastomer products, not recommended for cosmetic purposes. 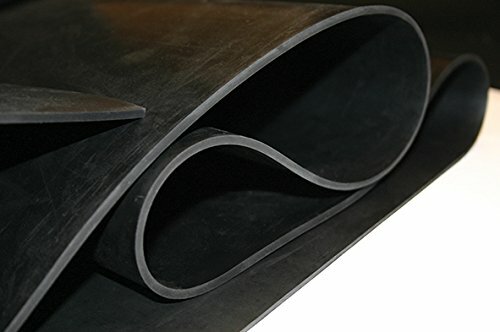 Neoprene is typically used for gaskets, seals, weather stripping, flashing and anti-vibration isolation. It's also fantastic for sealing, soundproofing, insulating, padding, seat covers, minimizing speaker vibration, protecting desks from denting under monitors and printers, and nearly anything else you can imagine. It can even be used to prevent static build-up in electronics when used as laptop sleeve, mouse pad, or tablet holder. Rubber Neoprene Sheets are simply outstanding for any DIY project you can imagine. If you have any questions about this product by Rubber Sheet Warehouse, contact us by completing and submitting the form below. If you are looking for a specif part number, please include it with your message.